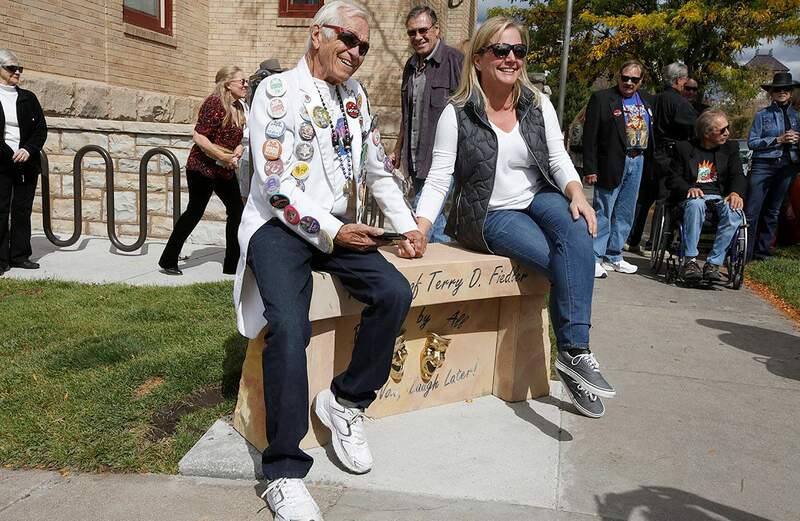 Longtime Snowdown participant Eddy Wilson, left, and Amy Fiedler, daughter of Terry Fiedler, a founder of Snowdown, sit on the bench dedicated to her father after a ceremony Saturday in front of the Durango Elks Lodge on the corner of Ninth Street and East Second Avenue. Terry Fiedler, known locally as “Mr. Snowdown,” was both famous and infamous in Durango, longtime friend Davitt Armstrong said. Now, the duality of Fiedler’s character and legacy has been immortalized with a dedication of a stone bench at the corner of East Second Avenue and Ninth Street in his honor. More than two dozen people gathered for the dedication. 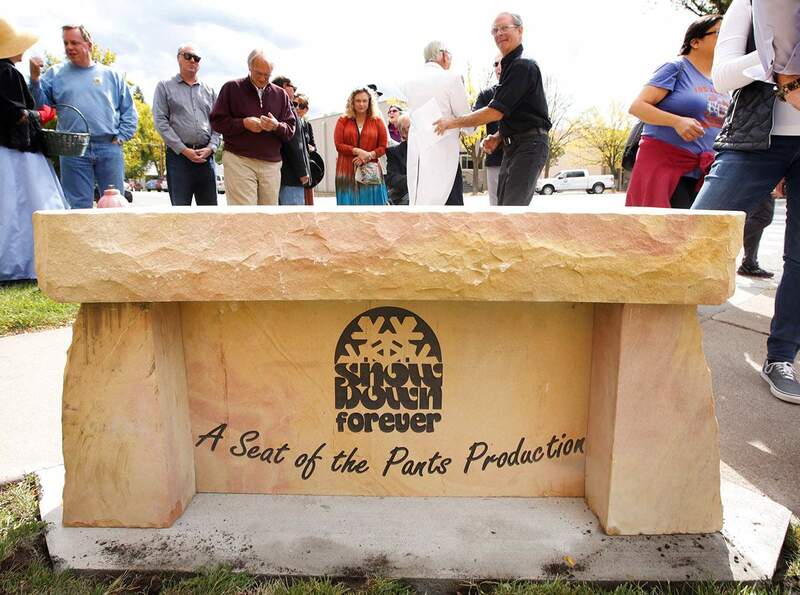 The words “Laugh now, Laugh later” chiseled into the bench are an attempt to capture Fiedler’s larger-than-life character – an energy he brought so often as a decades-long coordinator of Snowdown. 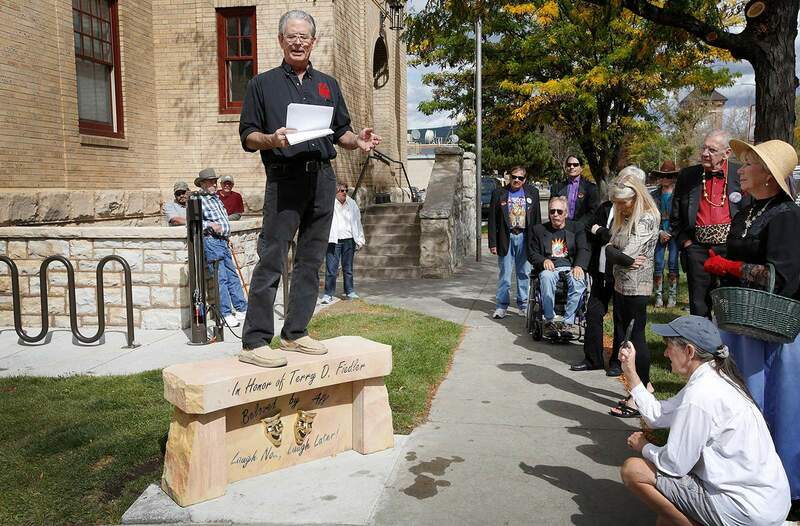 Davitt Armstrong holds back tears as he talks about his late friend Terry Fiedler, a founder of Snowdown, during a bench dedication ceremony to Fiedler on Saturday in front of the Durango Elks Lodge on the corner of Ninth Street and East Second Avenue. Fiedler died in March at the age of 77 after a long battle with Alzheimer’s disease. Mayor Sweetie Marbury proclaimed Saturday, with a hitch in her voice, that Oct. 8 will be recognized as Terry Fiedler Day. “He was full of merrymaking, and he brought magic to Durango,” Marbury said. The magic he brought came in the form of Snowdown, a weeklong celebration of winter every year for the past 40 years. Legend has it that in 1978, the idea of Snowdown was born over Budweisers and a Broncos game in the living room of Fiedler and his then-wife, Linda Mannix, along with their friend, John Murrah. The hope was to give a needed jolt to the lagging winter season by organizing affordable, outlandish events during the last weekend of January – to “shake up the town when we are tired of cold, short days,” Mannix said in 2014. The backside of the bench dedicated to Terry Fiedler in front of the Durango Elks Lodge on the corner of Ninth Street and East Second Avenue. Fiedler’s last Snowdown was around 2011, but for those who knew him, his legacy continues through the annual festival, and the memories he created in the Durango community. Peg Ochsenreiter, a 25-year member of the Snowdown Board of Directors, said Fiedler possessed a care for the community that came in the form of his “diplomatic” leadership of Snowdown. Amy Fiedler, Terry’s daughter, said Saturday that she struggled to come up with a favorite memory of her father – she has too many. Her father gave so much to the community, and the community gave him so much in return, Fiedler said. Durango will always be home, she said. “The love and support this community has shown my father is truly amazing,” Fiedler said.